Oakridge Global Energy moves into new 68,718 sq ft home for corporate offices and small format manufacturing. Oakridge Global Energy Solutions, Inc. (OGES) is pleased to announce that it has moved into a new 68,718 square foot facility for corporate offices and small format cell manufacturing. 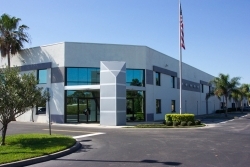 Over the course of the next 18 months Oakridge Global Energy Solutions (OGES) will ramp up and install more than 2.6 Gigawatt-hours of production capacity of U.S. manufacturing of electrodes, cells, and batteries in its facilities located in the Brevard County, Florida area, known as the Space Coast. This equipment is being housed in over 350,000 square feet of new manufacturing space. About Oakridge Global Energy Solutions, Inc.
Oakridge Global Energy Solutions Inc., is a publicly traded company, trading symbol: OGES on the OTCQB with a market cap of just over $300,000,000 USD, whose primary business is the development, manufacturing and marketing of energy storage products. Additional information can be accessed on the company's website www.oakg.net. Forward-Looking Statements Disclaimer: This press release contains forward-looking statements within the meaning of Section 27A of the Securities Act of 1933, as amended, and Section 21E of the Securities Exchange Act of 1934, as amended. In some cases, you can identify forward-looking statements by the following words: "anticipate," "believe," "continue," "could," "estimate," "expect," "intend," "may," "ongoing," "plan," "potential," "predict," "project," "should," "will," "would," or the negative of these terms or other comparable terminology, although not all forward-looking statements contain these words. Forward-looking statements are not a guarantee of future performance or results, and will not necessarily be accurate indications of the times at, or by, which such performance or results will be achieved. Forward-looking statements are based on information available at the time the statements are made and involve known and unknown risks, uncertainties and other factors that may cause our results, levels of activity, performance or achievements to be materially different from the information expressed or implied by the forward-looking statements in this press release. This press release should be considered in light of all filings of the Company that are contained in the Edgar Archives of the Securities and Exchange Commission at www.sec.gov.